Dodge was formally known as the Dodge Brothers Motor Vehicle Company from 1914 through 1927; the Chrysler Corporation acquired the Dodge Company in 1928, and in 1935, Dodge introduced its new DU valve six-cylinder engine and DU models with revised coachwork styling. 1935 wasn't exactly a stellar year for the Dodge brothers, but with a total of 158,999 vehicle sales, it wasn't their worst year either. In a continuing effort to take market share away from Ford (the company they had once manufactured engines for), the Dodge boys were constantly trying to come up with new ways to entice the buying public to consider their products for purchase. 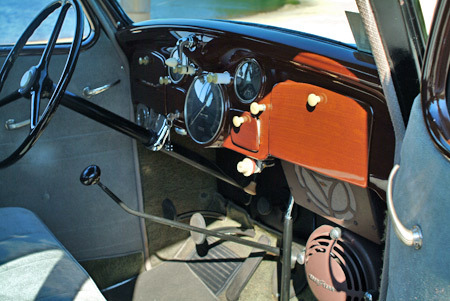 The DU Coupe was the Dodge boys' 'old college try,' as they hoped the new model would appeal to the well-healed parents of college-bound students. 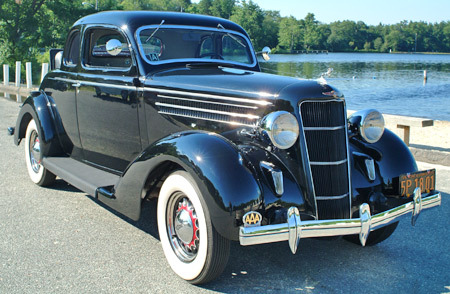 The new Dodge DU models were termed as the company's 'New Value' line, which was the result of promotional brainstorming and the 1935 Dodge DU Coupe was one of the 'New Value' models. Dodge unveiled the vehicle late in the 1935 model year, in hopes that the DU, equipped with a rumble seat, would appeal to the rich folks of the era to buy it for their college-bound kids. The scarcity of 1935 DU coupes today makes it hard to assess whether this strategy worked or not - total two-seat coupe production for 1935 was 17,800, and it sold for $645.00. 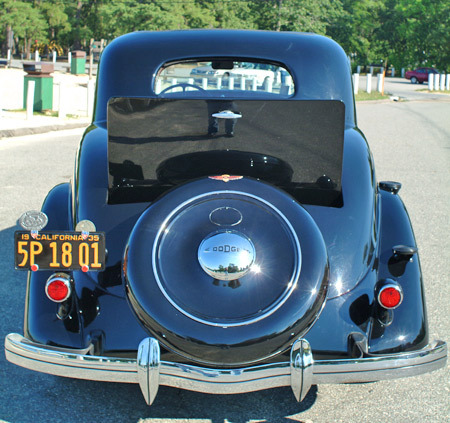 Because of the rumble seat, there was no trunk, per se. Hence, there was no place to stow the spare tire except externally, making this the precursor to the 'continental kit'. The DU brought with it new styling and many new visual cues including a lower roofline, lower floor, narrower radiator grille, a concealed radiator cap and parking lights mounted on the front fender aprons. Mechanical innovations for the DU line included hydraulic brakes, Autolite ignition, a ventilated clutch, automatic choke, leaf spring front suspension, easy steering and a crank-open windshield. Weight distribution was improved and the interior compartment was expanded by moving the engine 8 inches forward in the engine bay. The current custodians of this featured DU coupe are Bob and Fran Weisiger, who are the third owners. 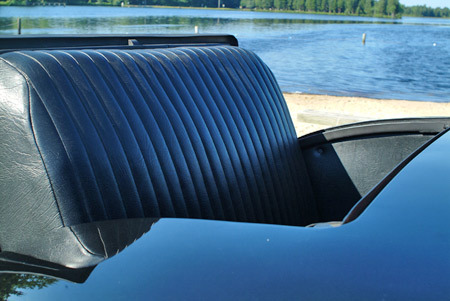 Originally an Ontario, California car, the coupe now resides in South Central New Jersey, where it is frequently taken on 65mph jaunts on the Garden State Parkway and other New Jersey roads in the Pine Barrens of Ocean County. The coupe has a 116-inch wheelbase and is powered by an 87-horsepower straight six-cylinder engine displacing 217.8 cubic inches. The engine is mated to a three-speed selective sliding gearbox with a single-plate dry disc clutch. A vacuum clutch and overdrive were also offered as optional equipment on DU models. 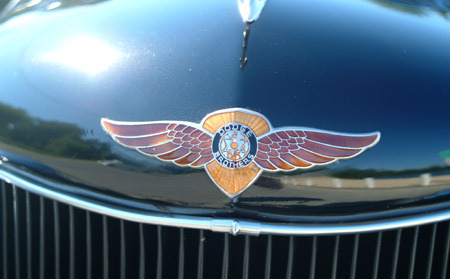 The famous six-pointed star logo of the Dodge brothers adorns the nose of the DU coupe. Bob Weisiger discovered the car back in 1982 while on a business trip in California and, as he put it, "I felt sorry for it, so I bought it and had it trucked back to New Jersey." When he found the car it had been gutted - the interior and dash were out of the coupe as it was being prepared to become a street rod. Weisiger got most of the gutted parts with the car, but the seats had to be reupholstered and he had to replace all of the missing gauges from the dash, which he confides was an arduous task. It took him a little over 13 years in total to complete the restoration while working on it in his spare time. He says it was a long-term project, largely because of the difficulty in obtaining NOS and restoration parts for Chrysler products; such items as missing chrome strips and gauges are particularly hard to come by, although the motor parts weren't a problem at all. This rear view of the car shows the symmetry of its lines, starting at the roof and working its way down to the bumper. 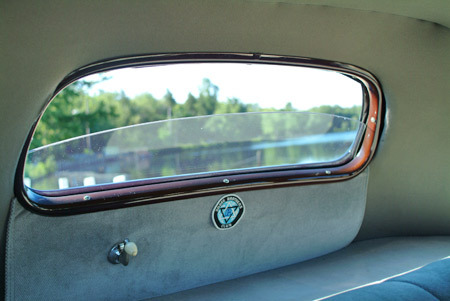 In addition to the factory rumble seat, the DU coupe is also outfitted with an exterior spare tire carrier - the forerunner of the "continental kit," if you will. Other factory-installed goodies include the radio and the flip-down tinted glass sun visors. An interesting aftermarket accessory is the Goodyear heater, a popular item of the era purveyed by Pep Boys and other auto parts and accessory dealers during the 1930s and 1940s. The 217.8cid straight six is fed by a single-barrel carburetor with an oil-bath breather. This DU coupe gets a regular workout going to local cruise nights and car shows in South Central New Jersey. Bob and Fran enjoy taking the DU out for rides and frequently show up at local car shows and cruise nights where the pristine coupe consistently garners its share of trophies and admiring looks. The leather rumble seat of the DU was a marketing hook that the Dodge brothers hoped would entice well-to-do parents to purchase the car for their progeny headed off to institutions of higher education. 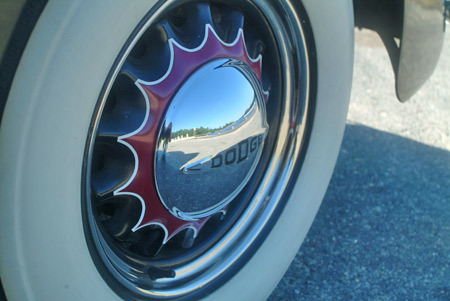 Chrome 'baby moon' hub caps a la Dodge adorn the finely-pinstriped factory wheels with 'gansta' whitewalls. Factory air,' 1935 style. 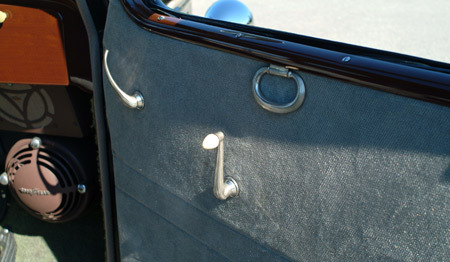 The rear window was retractable via a crank, affording ventilation and communication with the rumble seat passenger(s). The door pulls, door handles and window cranks are polished pewter that almost look like silver, a nice period touch instead of the all-too-common chrome appointments. 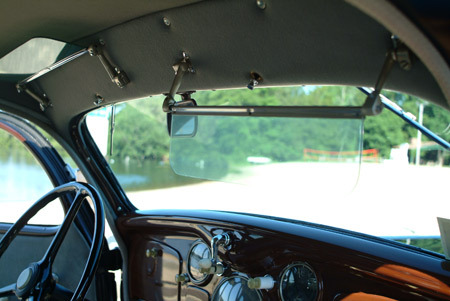 Tinted glass sun visors and a crank-open windshield were standard features of the DU series of Dodge cars. New body cues included fender-apron-mounted parking lamps, a narrower grill and a concealed radiator cap. 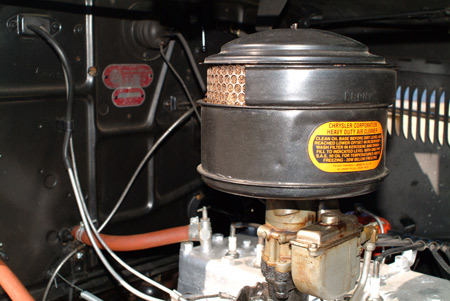 A popular aftermarket accessory was the Goodyear heater, visible just below the factory-installed radio speaker. These heaters were available from Pep Boys and other auto parts and accessory stores of the period. 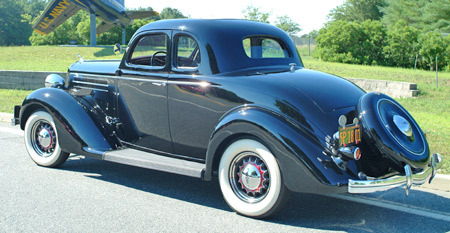 Saved from becoming a street rod, the restored '35 DU Coupe is quite a looker. While Dodge DUs were rolling off the assembly line in 1935, a contract between U.S. and German companies was signed to receive the German airship LZ 129 Hindenburg at Lakehurst Naval Air Station in New Jersey for landings of its trans-Atlantic flights. 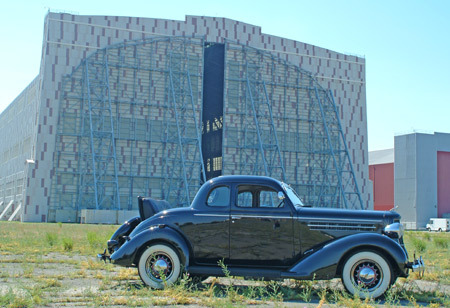 Here the DU coupe sits parked in front of the Hindenburg's hangar, scarcely 50 yards away from the actual spot the airship met its fiery demise on May 6, 1937.